With Record Store Day fast approaching (Saturday April 18), we are in the final stages of finalising this years Diggin’ Melbourne and Diggin’ Sydney record store maps. Both Sydney and Melbourne have again expanded the list of stores – with Melbourne now busting at the seems with 54 stores, and Sydney has broadened their range to include 33 stores from all sides of the city – and even out to Katoomba. There are some exciting new stores for the dedicated! The Melbourne maps will hit the streets in just a few days – giving you plenty of time to plan your RSD attack! We will once again be collaborating with Beat magazine to present a Record Store Day supplement – listing all the Diggin’ spots plus a full list of Record Store Day activities at all the participating stores. The Beat supplement will be published on Wednesday April 15. There’s so much action coming your way on Record Store Day it might be an idea to get out there before it happens. Check this – we have a new store in the city called Vinyl Alive, two new shops on Smith Street in Collingwood, Plug Seven (pictured below) and Eureka Rebellion Trading, Vinyl Space opening in upcoming days on Johnston St and a new Goldmine Records on St. Georges Rd in North Fitzroy + other new stores/listings include Prime Cuts in Reservoir, Metal Mosh in Frankston and more to be announced! Full details coming soon. Pictured above and below: Plug Seven Records in Collingwood – one of the new listings for 2015. A massive selection of vinyl spanning rock, punk, reggae, soul, jazz, latin, funk, hip hop and more + a back room full of bargains. Tell ’em Diggin’ Melbourne sent you! Want more? 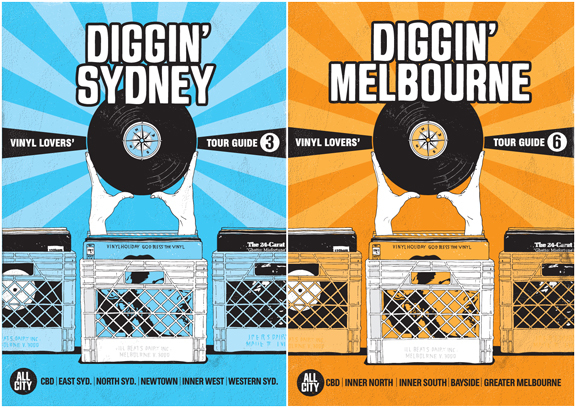 We’ll be updating the Diggin’ Melbourne website in upcoming days. Follow us to get notification + a head start!